So I ended up writing this article on creating a Cisco Packet Tracer Dial Up dial up lab. The topology we will be using is shown below. Turn off both the PCs, remove their default modules and place the PT-HOST-NM-1AM module. Turn them on. 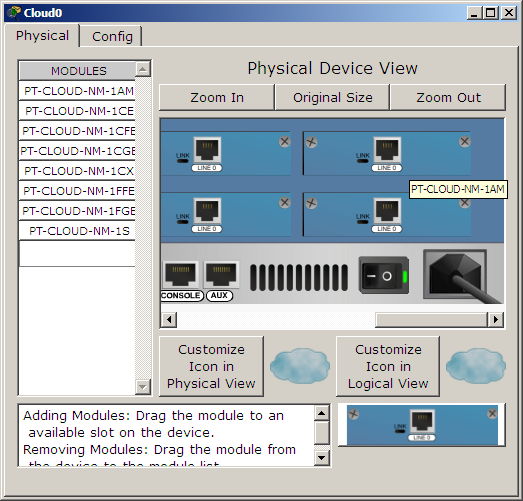 Turn off the cloud and place 4 PT-CLOUD-NM-1AM modules. The number of modules for the cloud depends on the number of PCs using the dial up utility. Double the number of PCs. Turn on the cloud now. One port per dial up PC is required. Turn on the router. 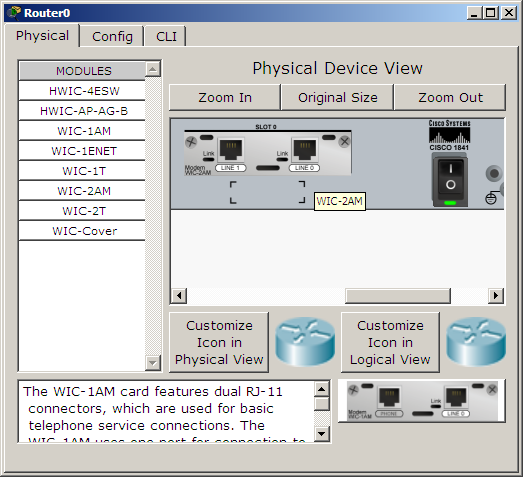 Connect all the devices as shown in the topology screenshot. Use the Phone cable from the Connections section. 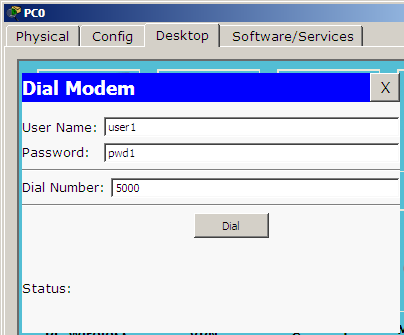 Open the cloud, go to the config tab, select each Modem interface and assign a phone number. I’ll be using the following phone numbers. It doesn’t matter what numbers are used on the interfaces connecting to the PCs. Make note of the phone numbers of interfaces connected to the router. These are the dial up numbers. We need to configure IP addresses in the the router’s modem interface. Click on the router and open the Config tab. Hey wait a minute why are we going to the config tab? Why not open the CLI tab and do it with commands like a real Cisco pro? You may do ahead a try but you’ll find that entering interface Modem0/0/0 will throw an Invalid input detected at .... error. So the only way of assigning IP addresses to the modem interfaces is through the Config tab. 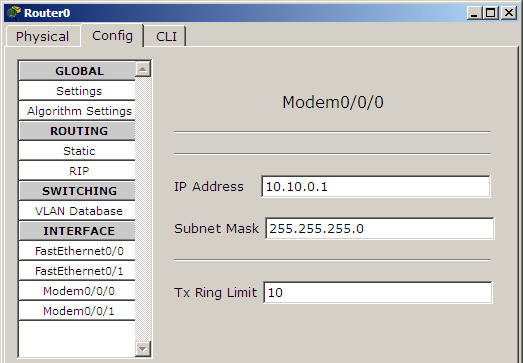 Once under the config tab click on a modem interface and assign an IP address and subnet mask. I’ll be using the following IP addresses. The router needs to be a DHCP server to assign IP addresses to the dial up clients after a dial up connection is established. Open the CLI tab and configure two DHCP pools. One for each modem interface. If you have more dial up clients more DHCP pools have to be configured. Next is to configure a username/password combination. While a single credential is enough you may create as many as required. Open a PC, go to the desktop tab and click on the Dial up option. Fill the username, password, dial number fields and click the Dial button. A dial up session will be established and the link will light up. 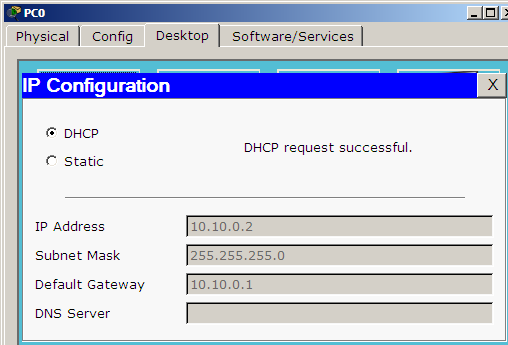 Now the PCs need to obtain IP addresses so click IP Configuration and choose DHCP on both the machines. Now ping both PCs and use simulation mode to see how packets are flowing. 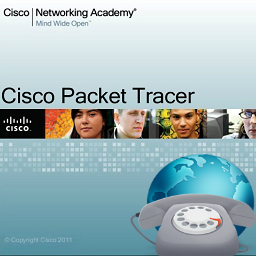 Download this Cisco Packet Tracer Dial Up lab.